I’ve been asked to do some nice, simple soup recipes. Since the cold weather is getting underway I thought now might be a good time to do it. 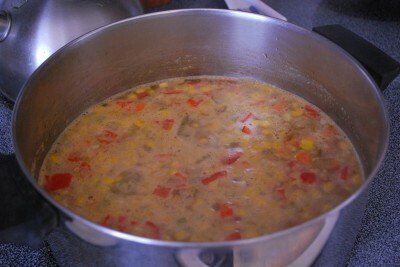 I love soup, but we don’t eat much of it in the summer since it’s hot. Once I tried making a cold cucumber soup – Barry was NOT a fan. He said, “That’s just wrong. 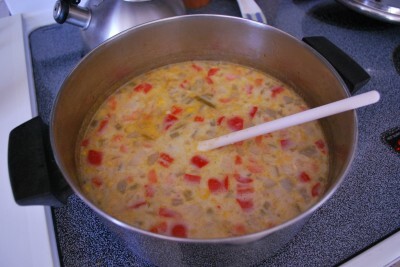 Soup is supposed to be hot.” Since then there have been no more cold soups in my house. I’m bitter. Monday is designated Meatless Monday in our home, so in honor of that I’m starting out with something bean-based. Beans, beans, good for your heart……well, you can finish it. 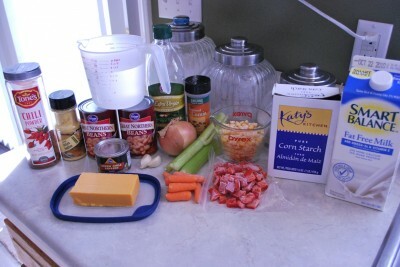 We need Great Northern beans, chili powder, chicken bouillon, water, chopped green chilies, cheese, garlic, olive oil, carrots, onion, celery, peppers, corn, cumin, cornstarch and milk. Originally I meant to add chopped jalapenos to this, but I forgot. That might have been a little too spicy for Annie though. We’re trying to teach her to love hot food, like us…..so I’m starting out slowly. She LOVED this soup. Sure, she didn’t eat the red peppers but that’s ok. More for me! You need to rinse and drain both of the cans of beans. Why? Draining them gets rid of the gas. Well, at least we hope so. It can’t hurt to try! I pour mine into my colander with small holes and run it under water until they get nice and clean. This is my favorite colander. If it breaks, I’ll have a funeral for it. Please send flowers. 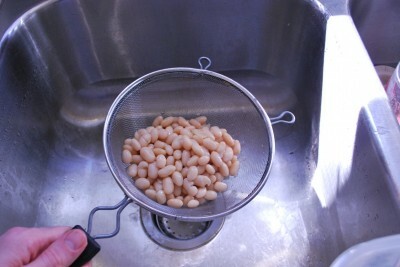 Now, in a small bowl attack one can of beans with your potato masher. Remember it from Crash Hot Potatoes? Dig it out again. This bean mixture is going to make our soup a little thicker. Isn’t it fun to mash things?! In a medium sized soup pot (my Grandmaw gave me this one when I started college) you’ll sauté the onion, pepper, and celery in some olive oil. Sauté them just until tender. Add the chopped garlic and sauté only one more minute. You don’t want overdone garlic…..it scorches easily and burned garlic has a very bitter taste. Trust me. Let’s stop a minute and have a garlic lesson. When you buy a bulb of garlic at the store, it will have several cloves inside. Recipes call for a certain amount of cloves. You just pull off the papery skin and break off the amount you need. Each clove will have a skin on it. 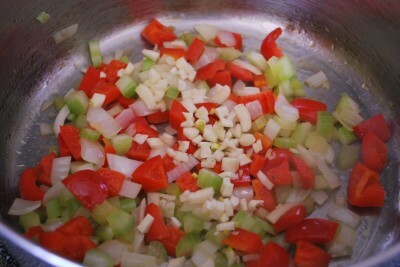 To get rid of the skin easily, take your knife and place the flat side down on the garlic (see photo). Now, press down or smack with your hand. Remove the knife and the paper skin should just peel right off. Cool, huh? Try not to confuse a bulb and a clove…..that could result in some very interesting dinners at your house. Vampires anyone? When your garlic is done, add the mashed beans, water, chicken bouillon, corn, carrots, chilies, cumin, chili powder and remaining whole beans. Isn’t it pretty? 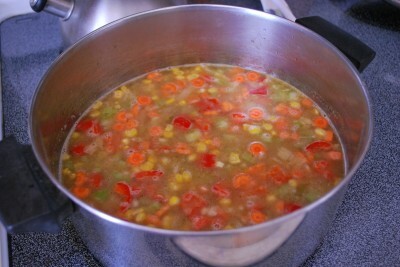 If you don’t have bouillon, you can just add two cans of chicken broth and omit the water. I’m always full of options here at Humorous Homemaking. 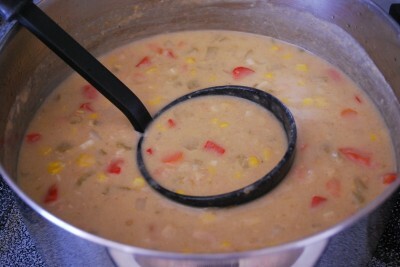 Bring your soup to a boil and then reduce the heat. You want it to simmer. I tried to capture it with a photo, but it doesn’t really explain well. A simmer is when your soup is semi-boiling. You just want little bubbles breaking the surface occasionally. It helps it cook slow so it won’t be overdone. This is usually done over medium-low to low heat. Don’t put the lid on. Let your child use it to start her own band. Simmer your soup about 20 minutes. In a small bowl, mix your cornstarch and milk. 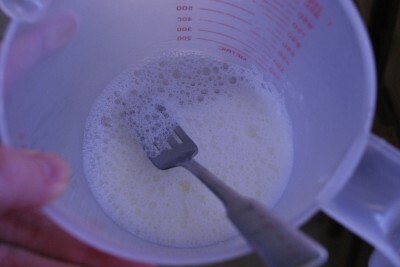 I start with a small amount of milk added to my cornstarch to make sure I get it nice and smooth. Clumpy cornstarch does not make happy soup. Someone will ask, “What’s this white thing floating in my soup?” Once I get the small amount mixed, I add the rest of the milk. Always add cornstarch to COLD liquid. Why? Because my Mama said so, that’s why. Oh and because it will form lumps if you don’t. 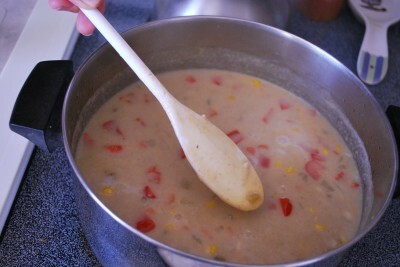 Now, pour your cornstarch mixture slowly into your soup. Stir very well and bring the soup to a boil. You don’t want to leave your pot right now. Stay there. Do not be distracted by the baby carrying the broom around the kitchen. Stir your soup very regularly so it won’t scorch. It’s going to take about 3-4 minutes for the soup to start getting thick. You’ll want it to coat the back of your spoon. 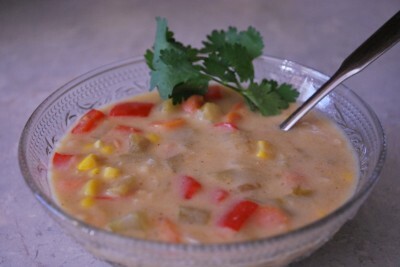 Chowders are nice, thick, creamy soups. It’s time to add the cheese! Cheese makes me happy. Cheese makes Annie happy. We’re a cheesy household! 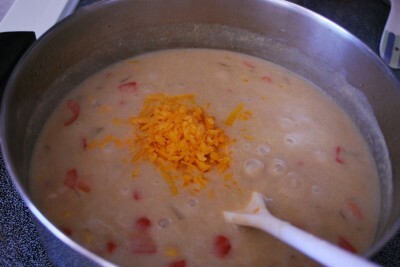 You can take your pot off the heat and stir the soup until the cheese is melted. It doesn’t need to cook any more, you just want you cheese all melty and delicious. Look how pretty! I just love soup. Especially pretty soup. 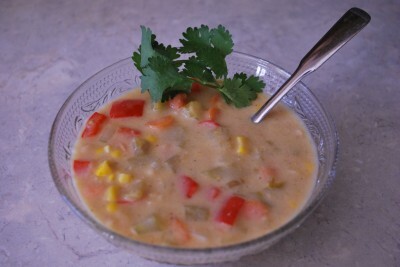 You can eat it right away, but as is the case with most soups, it will taste better tomorrow. Soup is just better when it sits for a while. That’s why I like to make big pots so we can enjoy it for lunch several days. This would be excellent to pack in a lunch! See all the nice spices and the pretty red peppers? You can add cilantro as a topping if you like. I am a stay at home mom and I home school our boys. Tupperware has helped make this possible by providing extra income. After selling Tupperware for a few years, I became a manager a bit over a year ago. This allows me to meet people and help meet their needs through Tupperware. I show Hosts and customers how they can save time and money through a non-traditional Cooking Demo instead of a traditional party. I also teach them how to cook in the microwave – everything from main courses to desserts. Storage ideas are a great way to save even more money. Tupperware is currently having a GREAT Sale: 40% off Modular Mates (our premier storage solution). If you book and hold your very own Cooking Demo, I will give FREE TUPPERWARE products above and beyond what you normally earn from Tupperware by hosting an event. If you would like to join my team and sell Tupperware, I will be there all the way for you. If you book a demo or join my team and mention you saw this ad I will give you a special gift. Tupperware can make your life a lot simpler. For more information, visit my website at www.tryplastic.com or call me at (276)466-2152. I look forward meeting you and helping you receive FREE TUPPERWARE! 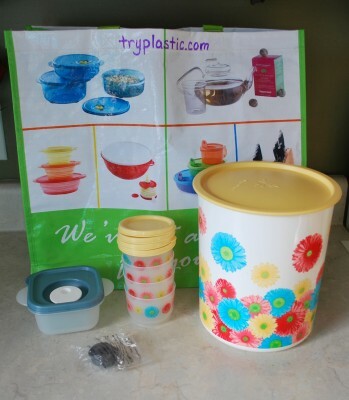 Up for grabs this week is this Tupperware set valued at $39! You’ll get this super cute flower canister with 4 matching snack cups with lids. There is also a nifty key-chain that has an actual Tupperware bowl on it! I think it’s pretty stinking cute…….if it doesn’t arrive in your package, I claim the fifth amendment. Ending up the set is a nice little snack cup and reusable Tupperware bag. To enter, click the button below and enter your email address. Please only enter once. I only use the email addresses to contact the winner. You have until Friday, January 21st at 9pm to enter. 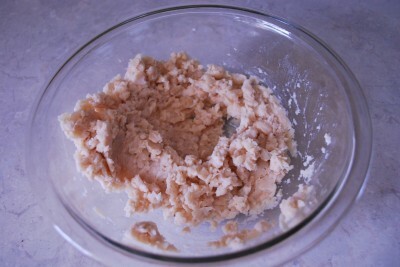 In a small bowl, mash one can beans with a fork or potato masher; set aside. 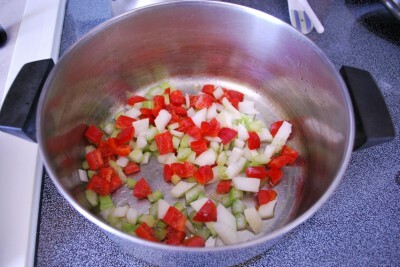 In a soup pot, saute the onion, celery and pepper in oil until tender. Add garlic; cook 1 minute longer. Stir in the mashed beans, bouillon, water, corn, carrot, chilies, cumin, chili powder and remaining beans. Bring to a boil. Reduce heat; simmer, uncovered, for 20 minutes. Combine cornstarch and milk until smooth. Stir into bean mixture. Serve with cilantro and additional cheese if desired.